Contemplating a home purchase this fall? 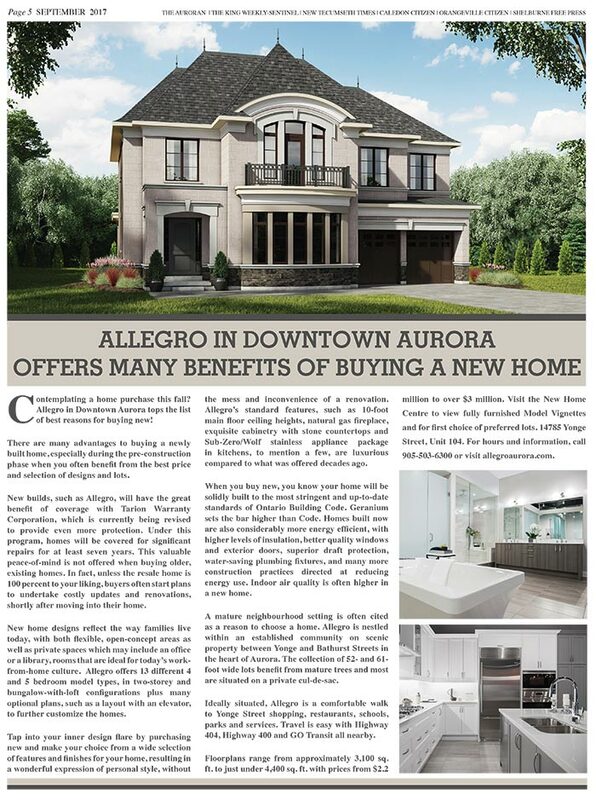 Allegro in Downtown Aurora tops the list of best reasons for buying new! There are many advantages to buying a newly built home, especially during the pre-construction phase when you often benefit from the best price and selection of designs and lots. New builds, such as Allegro, will have the great benefit of coverage with Tarion Warranty Corporation, which is currently being revised to provide even more protection. Under this program, homes will be covered for significant repairs for at least seven years. This valuable peace-of-mind is not offered when buying older, existing homes. In fact, unless the resale home is 100 percent to your liking, buyers often start plans to undertake costly updates and renovations, shortly after moving into their home. New home designs reflect the way families live today, with both flexible, open-concept areas as well as private spaces which may include an office or a library, rooms that are ideal for today’s work-from-home culture. 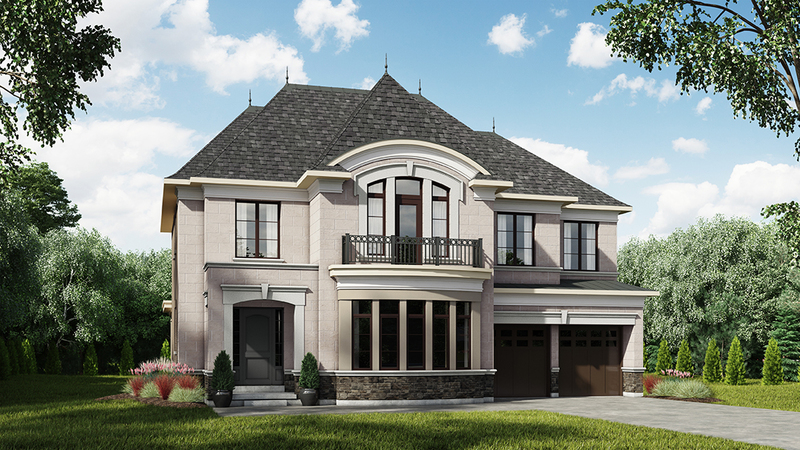 Allegro offers 13 different 4 and 5 bedroom model types, in two-storey and bungalow-with-loft configurations plus many optional plans, such as a layout with an elevator, to further customize the homes. a wonderful expression of personal style, without the mess and inconvenience of a renovation. 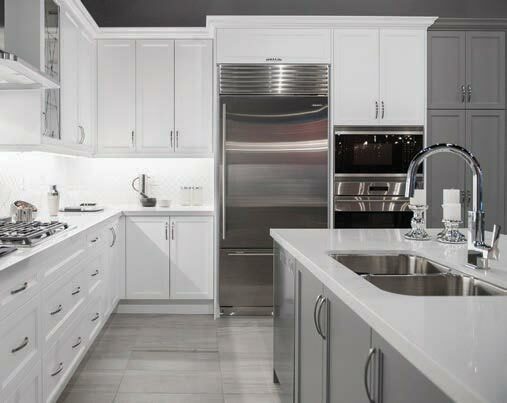 Allegro’s standard features, such as 10-foot main floor ceiling heights, natural gas fireplace, exquisite cabinetry with stone countertops and Sub-Zero/Wolf stainless appliance package in kitchens, to mention a few, are luxurious compared to what was offered decades ago. When you buy new, you know your home will be solidly built to the most stringent and up-to-date standards of Ontario Building Code. Geranium sets the bar higher than Code. Homes built now are also considerably more energy efficient, with higher levels of insulation, better quality windows and exterior doors, superior draft protection, water-saving plumbing fixtures, and many more construction practices directed at reducing energy use. Indoor air quality is often higher in a new home. A mature neighbourhood setting is often cited as a reason to choose a home. Allegro is nestled within an established community on scenic property between Yonge and Bathurst Streets in the heart of Aurora. The collection of 52- and 61-foot wide lots benefit from mature trees and most are situated on a private cul-de-sac. Ideally situated, Allegro is a comfortable walk to Yonge Street shopping, restaurants, schools, parks and services. Travel is easy with Highway 404, Highway 400 and GO Transit all nearby. Floorplans range from approximately 3,100 sq. ft. to just under 4,400 sq. ft. with prices from $2.2 million to over $3 million. 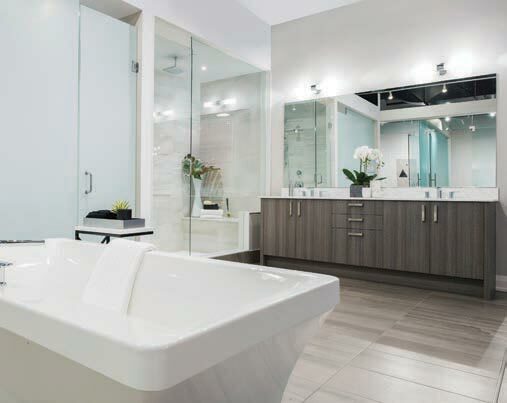 Visit the New Home Centre to view fully furnished Model Vignettes and for first choice of preferred lots. 14785 Yonge Street, Unit 104. For hours and information, call 905-503-6300 or visit allegroaurora.com.